Phillips Sails have earned a reputation for quality rigging services over the past 51 years, largely due to the expertise of Bryan Phillips himself. As the owner/operator, Bryan assumes an active role and has a wealth of experience behind him. Bryan's experience is your gain. Philips Sails offer only the most reliable products available on the market today including Furlex furlers, Selden hardware, Liros and FSE dyneema ropes, along with the full range of Harken and Ronstan fittings – that's piece of mind for you. As any yacht owner will know, the benefits of maintaining the standing rigging should not be overlooked, it's a sensible investment. Phillips Sails is widely regarded as the rigging authority on Lake Macquarie, so we can comfortably manage all your standing rigging needs, no matter how big or small. Carbon fibre masts and spars are the pick for those searching for supreme performance and exceptional longevity. Phillips Sails are the only recognised rigging team in the region to offer professional rigging services specifically for carbon spars. 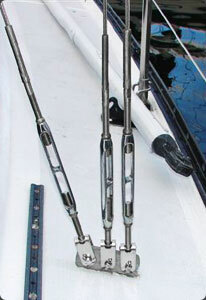 Of course, we're more than competent with traditional alloy spars too! So whether you need standing or running rigging, a new furler or deck hardware, a custom canopy or a boom cover, come and talk to Bryan at Phillips Sails ... tap into his experience, you can't go wrong!